Glider Rocker Cushions can be hard to come by but we manufacture awesome ones. Our Glider Rocker Cushions are made from 50/50 cotton/poly duck. This is a fairly hard canvas type material which looks GREAT, wears like iron and comes in a great selection of colors. 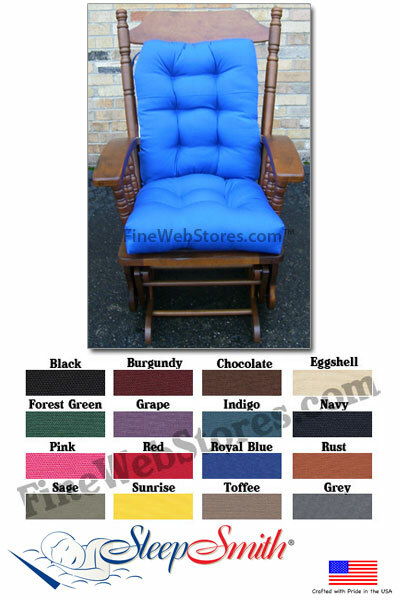 Actual replacement glider rocker cushions, glider rocker pads and glider rocker chair cushions can be very hard to find. Different brands use different configurations of ties, snaps, sizes, etc. We have come up with a generic, very usable and very comfortable alternative to help make your glider rocker super comfortable again! The seat cushion is 16" x 18"
The back cushion is 17" x 21" with some narrowing to the rear. Cushions come with ties to secure to glider rocker chair. The Glider Rocker Cushions Standard Size Duck Fabric is made from 50/50 cotton/poly duck fabric.